Avoiding jaw injuries is as simple as avoiding excessive forces into the jaws. It is possible to develop muscle contraction forces of sufficient strength to damage components of the temporomandibular joints (TMJs). Frequent chewing of hard or sticky foods (for example, ice, hard candies, certain energy bars, breads, bagels, etc.) endangers not only the teeth, but the jaw joints themselves. Avoidance of, or softening of these foods before eating them is protective. Clenching or grinding the teeth also places excessive functional demands on the jaw joints and can damage them. A tooth grinding habit (bruxism) also causes the biting surfaces of the teeth to wear away, and cause the jaws to close down farther than normal (loss of vertical dimension of occlusion). When this happens, a shortening of the closing muscles of the jaws occurs, and the contraction forces they are capable of generating increases. This increases the forces on the TMJs, and can increase the level of damage that occurs. If you are a bruxer during waking hours, you should make a conscious effort to stop the habit. If you brux while you sleep, and cannot eliminate the factors that cause the condition, your dentist can make you an occlusal guard to protect the teeth, jaw muscles and jaw joints. Excessive forces into the jaws can also occur via trauma. A sharp blow to the chin may be sustained in motor vehicle accidents or athletic activities, and the forces may be transferred into the joints, causing damage to one or both of them. Wearing a helmet specific to your activity can provide protection to the jaws that take into account the risk of the activity (for example, full-face motorcycle helmets, hockey, lacrosse and football helmets all afford substantial protection to the bones of the face, the mandible, and the TMJs). When chewing forces are not properly distributed on the teeth, the muscles may fatigue, the jaw joints may develop popping, clicking or grinding issues that impede smooth operation, and teeth/dental restorations may start to fail. The degree to which non-ideal functioning in the components of the joints, muscles and teeth (stomatognathic system) cause problems that a patient can detect or that need to be treated varies widely. Among the treatment options available for establishing equal tooth forces with the muscles at rest and the jaw joints stable is a procedure called occlusal adjustment or equilibration. The first step involves locating the stable position of the jaw joints (centric relation position). It is important that the jaw muscles be resting when this position is located, otherwise the teeth will be adjusted with the jaw in the wrong position. Generally the dentist will use a technique called bimanual manipulation to locate the position. The idea is, if the dentist can move your jaw for you, without your jaw muscles resisting, the stable-joint-resting-muscle position can accurately be established. When it is, the dentist will close your teeth into a bite registration material to record the position for future reference. The second step is to make impressions of your teeth, and reproduce them in dental plaster. Using the bite registration to properly index your upper and lower teeth, the dentist can use the casts to develop a “roadmap” for the adjustments that would need to be made on your teeth. The dentist performs the adjustments on the casts, and evaluates the amount of tooth structure that would need to be removed to establish uniform tooth contacts in this muscles-at-rest, stable-joint position of the jaws. The fully equilibrated casts produce a much more balanced (i.e. equilibrated) distribution of forces on the teeth. If it appears that this equilibrated position can be achieved without removing too much tooth structure, the dentist may recommend performing those same adjustments on your teeth. How much is too much? Generally, adjustments need to be confined to the enamel layer of the tooth, or there may be sensitive areas. If the adjustments would require the removal of significant tooth structure, fillings, onlays, crowns and even root canals may be necessary. Performing these procedures on stone casts allows the dentist to know in advance what dental procedures would be necessary to equilibrate the patient’s dentition. If it appears that excessive tooth structure would need to be removed, the dentist may recommend either orthodontic treatment, long-term use of an occlusal guard, a complete dental rehabilitation, or surgical repositioning of the jaws (orthognathic surgery). Dental rehabilitation generally involves multiple crowns, onlays, or at least fillings; and may lead to the need for root canal therapy on one or more teeth. Dental rehabilitation and orthognathic surgery cases are typically done outside the scope of dental plans, as they quickly exceed most dental plan benefit limits if the procedures are covered at all. 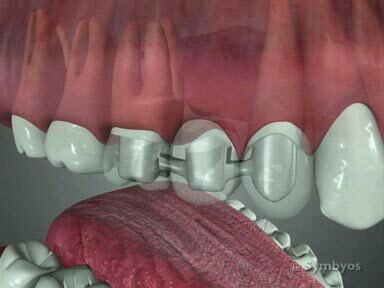 A tooth (or a few teeth) that exhibit fremitus, meaning the tooth vibrates a bit when the teeth are tapped together. This is generally a sign that the bite is heavy on that tooth, and would benefit from a limited adjustment. 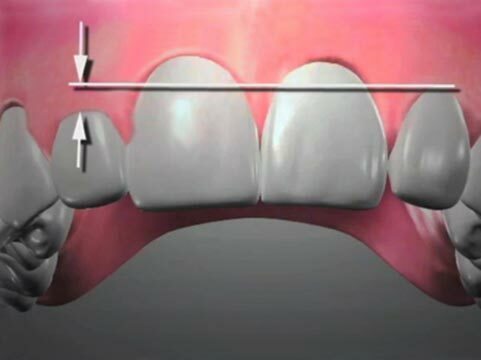 A tooth (or a few teeth) that exhibit abfractions—notched areas at the gum line that indicate improperly directed forces on the affected tooth. A tooth which is tender to biting after a concussion injury (traumatic blow or after biting down with excessive force on hard foods) may have a bruised periodontal ligament. When this occurs, inflammation of the ligament can elevate the tooth in the bite, causing it to hit first when the patient closes. A limited adjustment of the bite on such teeth can bring immediate relief. 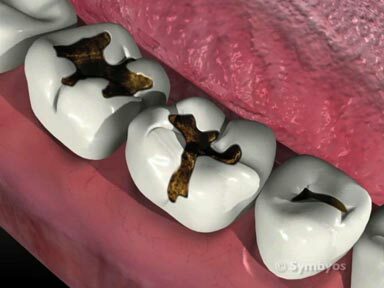 Sometimes a new dental restoration (filling or crown) may feel “high” in the bite when the anesthetic wears off, and it may be necessary to adjust the tooth a small amount at a later time. This does not mean excessive grinding on a new lab-made restoration should be performed, as this can significantly decrease the expected life of the restoration. Equilibration of the teeth is recommended if heavy bite forces (occlusal forces) are placing abnormally high pressure on just a few teeth, and the problem can be corrected comfortably without orthodontic treatment, dental rehabilitation, or jaw surgery. Equilibration is also frequently recommended prior to undergoing dental rehabilitation, in order to establish a comfortable jaw and muscle position for the patient before tooth restorations are built. Otherwise, the new (and expensive) dental restorations may be built in the wrong positions and the result can be premature failure of the new restorations, jaw pain and dysfunction, and chronic facial muscle pain. If improper alignment of the upper and lower teeth have led to exposed tooth roots (gingival recession), and a gum graft procedure has been recommended to cover the exposed root, it may be necessary to equilibrate the bite to eliminate underlying cause of the gum recession before fixing it. Otherwise, the grafted gum tissue may also recede. Malocclusion is the term dentists use to describe a non-ideal bite relationship between the upper and lower jaws. It is important to understand that many people have a non-ideal bite relationship, but tolerate the condition well without undergoing any treatment; and often without ever sustaining significant damage to the teeth, headache or muscle pain or jaw joint dysfunction. In those patients whom significant wear to the enamel, chipping or breaking of tooth restorations, jaw muscle popping, clicking or grating, inability to chew properly, or jaw muscle pain / fatigue are noted, intervention of some sort is typically recommended. In cases where there is a significant skeletal size discrepancy between the upper jaw (maxilla) and lower jaw (mandible), orthodontics, orthognathic surgery, or a combination of those treatments may be appropriate. Equilibration can be a definitive solution, or one step in the overall treatment plan for patients with malocclusions. This page was last updated on July 1, 2016.